Tea eggs, served warm or cold, are a common Chinese snack. The eggs are twice cooked: After the first boiling, the shells are gently cracked and then the eggs are simmered in an aromatic “tea.” The eggs absorb the delicate flavors of soy sauce and star anise and reveal an attractive crackle glaze once peeled. 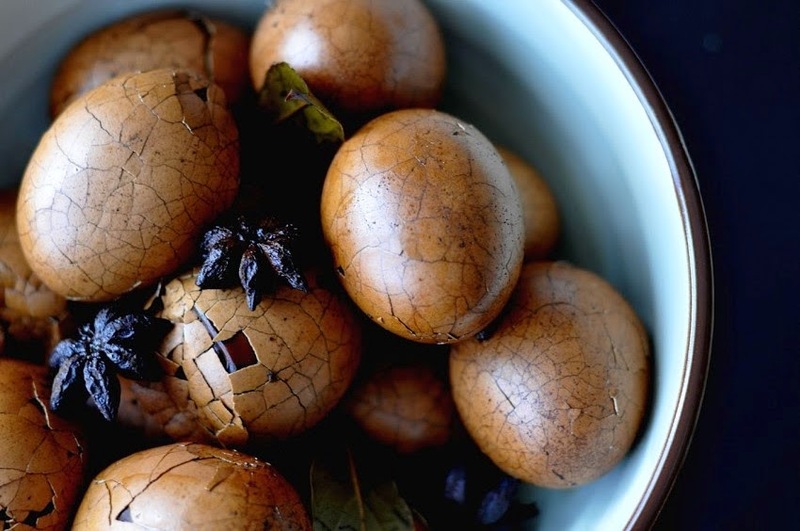 Not only are tea eggs nutritious and delicious, they’re also pleasing to the eye. 1. In a large saucepan, arrange the eggs in a single layer. Cover with water and bring to a rolling boil over medium-high heat. Remove the pan from the heat, cover, and let stand for 15 minutes. Drain and cover the eggs completely with fresh cold water. Allow to cool. 2. When the eggs are cool enough to handle, tap each one gently with the back of a teaspoon to make fine cracks on the surface of the shell. Try to keep the shells intact. 3. In the same saucepan, bring 3 cups of fresh water to a boil over high heat. Add the soy sauce, star anise, and tea bags. Reduce the heat to medium-low. Use a spoon to carefully lower the eggs one by one into the tea. If the eggs are not completely submerged, add more water. Cover and simmer for 2 hours. 4. Remove the saucepan from the heat and let the eggs sit in the tea liquid on the stove for 1 hour. Transfer to the refrigerator to steep for at least 2 more hours, or preferably 12 hours.